Poland Backtracks On A Controversial Holocaust Speech Law Under the law, anyone who accuses the country of complicity in Nazi crimes during World War II could face three years' imprisonment. But lawmakers voted to remove that penalty on Wednesday. Polish lawmakers voted overwhelmingly to remove prison penalties in a controversial Holocaust law. Prime Minister Mateusz Morawiecki (upper left) looks on as a right-wing lawmaker blocks the podium in a failed effort to obstruct the vote. Poland is taking steps to soften a controversial law that means anyone who accuses the nation of complicity during the Holocaust could be handed a prison sentence of up to three years. President Andrzej Duda signed the bill into law in February, after it was proposed by the ruling right-wing Law and Justice party. He said the law protected Polish interests "so that we are not slandered as a state and as a nation." The measure prompted criticism in Israel, the United States and Europe for whitewashing history and undermining free speech. Just four months later, Prime Minister Mateusz Morawiecki – also a member of the Law and Justice party – made an unexpected concession. He asked Parliament to amend the law by removing the criminal penalty of imprisonment. With the change, accusing Poland of complicity during Nazi occupation would be a civil offense and courts could still impose a fine. 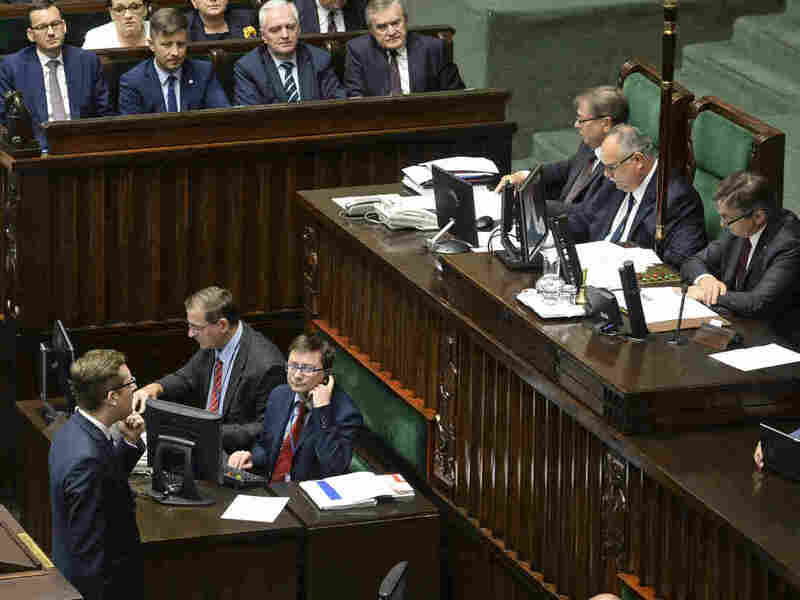 After debate on Wednesday in Poland's lower house of Parliament, lawmakers voted to remove the criminal penalties, which would stop courts from issuing prison sentences. The amendment was passed by the upper house later in the day. "Those who say that Poland may be responsible for the crimes of World War Two deserve jail terms," Morawiecki told lawmakers on Wednesday, according to Reuters. "But we operate in an international context and we take that into account." Morawiecki added that the law had been successful in raising international awareness of Polish victims during the Holocaust. According to a Polish lawmaker who spoke to Reuters on the condition of anonymity, Warsaw voted for the change in the legislation because it was seeking to bolster relations with United States "as a deterrence policy against Russia." The law refers to accusations against Poland as a country, not against individuals, and provided leeway for artistic and academic statements. But critics worried that it could make it a crime to discuss anti-Semitic acts committed by Polish individuals. At least 3 million Jewish citizens of Poland were murdered by the Nazis during the war, according to the U.S. Holocaust Memorial Museum. Non-Jewish Polish people were also killed. While thousands of Poles put their lives in danger to protect their Jewish peers, other Polish people participated in the murder of Jewish people, scholars say. Anti-Semitic pogroms occurred even after the Holocaust, including what the U.S. Holocaust Museum calls "a blood libel massacre" of at least 42 Jewish citizens. The World Jewish Congress welcomed the government's steps to amend the law. President Ronald S. Lauder said in a statement, "The law as it stands now stifles any real discussion of the extent to which local Poles were complicit in the annihilation of their Jewish neighbors during the German occupation. It sets a dangerous precedent and is contrary to the values Poland has worked to uphold and promote." A joint statement issued by the prime ministers of Poland and Israel on Wednesday sought to distinguish between the actions of individuals and the Polish state. "We acknowledge and condemn every single case of cruelty against Jews perpetrated by Poles during the World War II," the statement said. "We reject the actions aimed at blaming Poland or the Polish nation as a whole for the atrocities committed by the Nazis and their collaborators of different nations." It added, "We support free and open historical expression and research on all aspects of the Holocaust so that it can be conducted without any fear of legal obstacles." Wednesday's change to the law now awaits a signature from the Polish president.